Here are some answers to questions we are often asked by our customers. If your question is not answered here, please contact us. Do you supply Kit homes ? Yes we do. 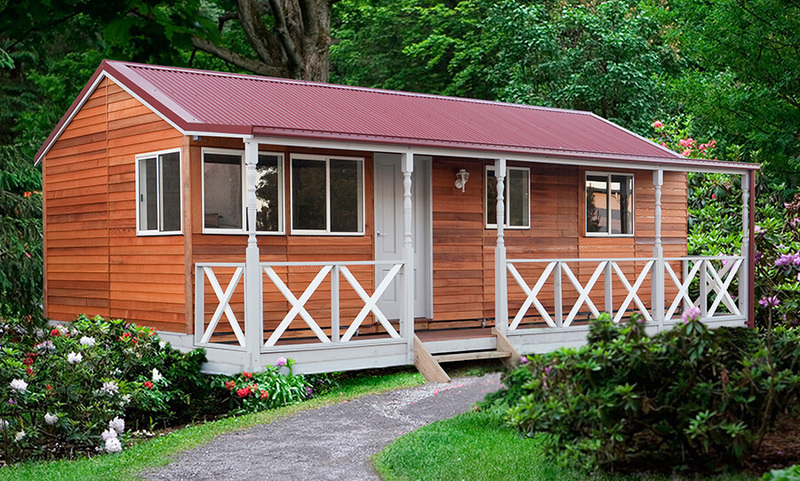 Our product range and the most popular kit homes, granny flats, cabins, bungalows, teenage retreats, resort modular homes, attic garages and 12&3 bedroom homes. We can build a home based on a design you have drawn yourself (a custom home). Our professional experienced personnel are on hand to help you with your design if you need it. Our existing plans may give you some ideas. Generally we deliver the goods 30 to 40days after signing the contract and 10% deposit received. Our website has all the information you may require, if there is something specific just contact us by email, phone or text. 5. Can I make changes to the design? When we’re building a home from your design, you can usually make changes, as long as it does not affect work that has already been carried out. Please contact us with the home of your choice for a cost estimate on Kit form, Lock up stage or for a fully completed home ready to move in..
40% 10 working days prior to delivery as the home is pre-made in our factory. Final balance of 50% before goods leaves the factory. Construction and assembly contract is a separate contract to the supply contract. 10% Deposit payment upon signing the contract. Do you have a warrantee/guarantee? Yes all components and workmanship are covered by full manufacturing warrantees. If we build your home to completion, there is a seven year structural guarantee. With a custom home, you can have any style you want! Alternatively, see our product and our range of popular kit homes, including contemporary, modern, heritage and country style homes. Yes. Homes can be built on sloping sites require a site inspection (obligation free) for us to make an accurate assessment and quote. We use high strength 90mm X 35mm MGP 10 treated pine & light gage steel frame for all Attic garages. 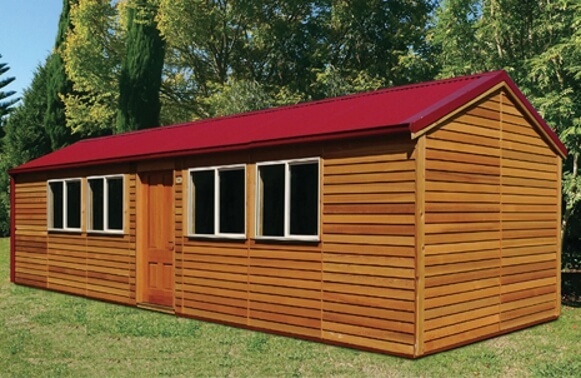 We use high quality western red cedar or weathertex for all the cladding and fittings. 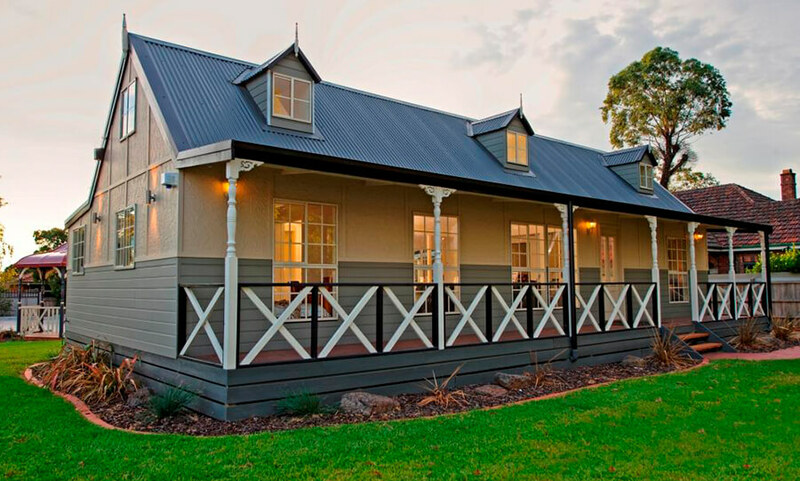 All our roof’s are built with a colorbond roof. What is the largest standard home you can build? Our largest modular home 14.4 0 meters long X 5.00 metres across plus 1.1 meter verandah. 3 Bedroom with ensuit and study. Can I have different roof lines on different models? Yes!, we are able to mix and match roof lines from different models. 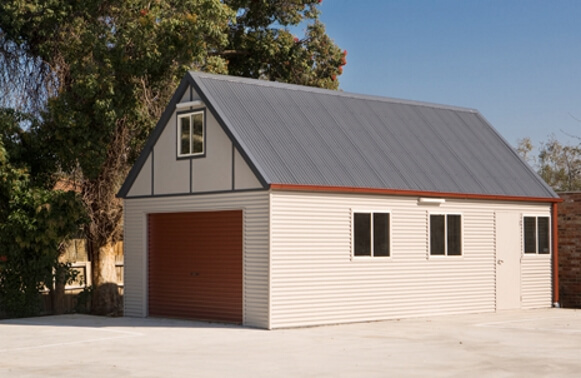 Examples are gable, hip, Dutch gable, eaves of your choice and verandahs to suit. No! We prepare written quotes at no obligation no charge. Will you quote my design? Most of the time we will. Our staff at will have a look and let you know if it is feasible using our modular system. Can I delete items from the inclusions materials list? Yes! Talk to us about a quote. Are your plans easily modified? Yes! W e will modify your plans to suit your site, aspect and personal needs. What is the cost of modifications? It varies, generally if the overall size remains the same, and the number of windows and doors is the same, then usually the price will be unchanged. Can I supply my own kitchen, bathroom and other items? 22. Can you supply & install the complete home including the kitchen, bathroom and all other optional extras. We provide a FREE assessment to all projects that are for lock up stage or to completed stage. If you are an owner builder then we can assist you with the choice of home that will suite you best.